Next week, I am going on holiday to Indonesia – a long-cherished dream coming true. Of course I am excited about the prospect of exotic markets, vibrant cities, meeting new people, stunning landscapes and drinking cocktails on a palm-rimmed beach. But I am also very curious about what remains to be seen of the Dutch colonial period, as I have read that most of what remains in terms of colonial architecture and archives is ‘crumbling.’ The upcoming trip reminded me of a number of publications on Dutch trade and scientific activities in the colonial era in what was called ‘Oost-Indië’ (East India) or ‘de gordel van smaragd’ (the emerald girdle). Between 1602 and 1795, the Verenigde Oostindische Compagnie (United East India Company, VOC) imported great amounts of a variety of goods from what is now Indonesia, such as tea, coffee, ginger, cinnamon, nutmeg, and tin. Many of these goods had some kind of medicinal purpose. Nutmeg for example, was not just appreciated as a spice, but also for its hallucinogenic properties, which were used to keep slaves calm during the long, arduous sea journeys. Although excessive use could cause deliria and even death, nutmeg was a sought-after commodity among medical men and even appeared in preparations of human anatomy sometimes. Yet the Dutch stationed in Batavia (now Jakarta) also wanted to have traditional European cures at hand, and many pills, potions, salves, and herbal plasters had to be made afresh as they could not be kept for long. Neêrlands O. Indien, Amsterdam, 1782. Courtesy of the Nationaal Archief. In a fascinating article on VOC laboratories that I read in a Dutch popular history magazine last year, Jeroen Bos shows that for these purposes, the VOC maintained at least two medical laboratories in Batavia. One was an independent ‘medicinal shop,’ a sort of apothecary shop; the other was the city hospital laboratory. A third laboratory was linked to the artillery and only produced gunpowder. Unlike the contemporary chemical laboratories at the universities of Utrecht and Leiden , the laboratories in Batavia were not aimed at chemistry research, but primarily at the production of drugs and quality control of the products the VOC acquired in the region, such as cinnamon and quicksilver. Unfortunately, hardly any detailed information about the lay out of the laboratories and exactly what was made and tested in them remains. The VOC ceased to exist on December 31st, 1799, as it had run into financial trouble. Yet the Dutch would continue to occupy parts of Indonesia until it became independent in 1945. (Actually, the Dutch occupied parts of Indonesia even longer, until 1949 – a particular painful and unflattering period in our history) Between 1800 and 1945, East India continued to be a source of fascination for researchers working for the Dutch government. German Caspar G.C. Reinwardt (1773-1854) for example, spend about seven years collecting data on the administration, nature and economy of Java, initiated reforms of its public health services and the education system, and established a botanical garden at Buitenzorg, just outside Batavia, where rare and potentially economically interesting plants were cultivated. As my colleague Andreas Weber has vividly described in his book on Reinwardt, the king obliged him to collect rare specimens for the Dutch Cabinet of Natural History on his field trips, and Reinwardt also employed other to amass natural history collections. Another colleague, Fenneke Sysling, in her 2013 thesis on physical anthropology in the Dutch East Indies in the nineteenth and twentieth centuries, argues that ideas about race were both made and broken in the colonies. Even today, some Dutch museums have uncomfortably large collections of skulls, skeletons, measurements and photographs of indigenous people, collected to answer the great anthropological questions of the time. How many different races were there in the archipelago, how were they divided over the islands? Questions that could never really be answered of course, but nonetheless the research was done for decades, and could only be done because of the often-violent Dutch colonial presence in the archipelago. With this knowledge, I will walk around the remains of Batavia. I am not exactly proud of Dutch colonial history, but I am grateful that my colleagues and I have the opportunity to research it. Indonesia has had a huge influence on Dutch trade and science over the centuries (not to mention on Dutch society, but that is another story), one that we should not forget, even if the physical remains of Dutch colonialism slowly disappear from the country. Also see Marieke M.A. Hendriksen, Aesthesis in Anatomy, PhD Thesis, Leiden University 2012, p. 154-6. Andreas Weber, Hybrid Ambitions. 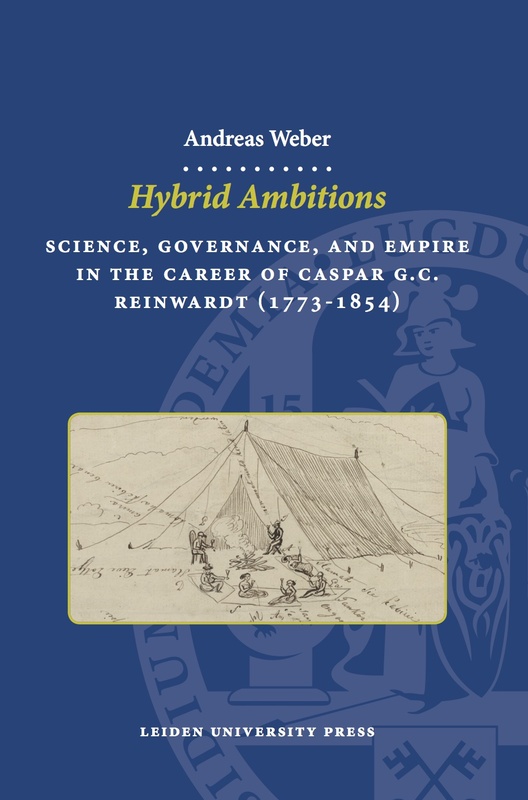 Science, Governance, and Empire in the Career of Caspar G.C. Reinwardt (1773-1845), Leiden: Leiden University Press, 2012. Fenneke Sysling, The archipelago of difference. Physical anthropology in the Netherlands East Indies, ca. 1890-1960’, PhD thesis, Amsterdam: Vrije Universiteit, 2013. 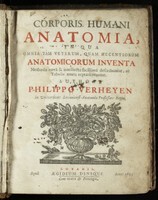 Verheyens 1693 ‘Corporis Humani Anatomia’ was reprinted 21 times and translated in several languages. I bet you clicked the link to the Letters, didn’t you? I did! And it’s a stub. Some people may now think ‘well, duh, of course, you shouldn’t just believe everything that’s on Wikipedia.’ Obviously you shouldn’t (as I keep stressing when I’m lecturing too), but by now I have read so many weird and wonderful things about early modern medicine and chemistry that a small part of me still wondered whether there was some truth to this story. So I looked Verheyen up in Picarta (the Dutch national library catalogue, a sort of Worldcat). He did indeed exist, wrote quite some interesting things on anatomy, but no letters to his leg. The other references I could check online do mention the amputated leg, but no dissection or letters. Then I continued reading the Wikipedia page and noticed that the author says that Verheyen studied at the Leids Universitair Medisch Centrum – indeed an existing institution, but a profoundly twentieth-century institution. 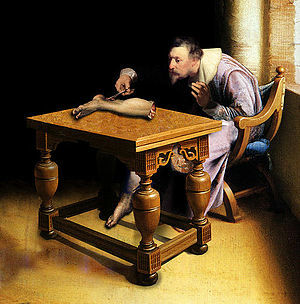 A bit annoyed with this nonsense now, I scrolled back up and had a closer look at the ‘painting’ of Verheyen dissecting his own leg. 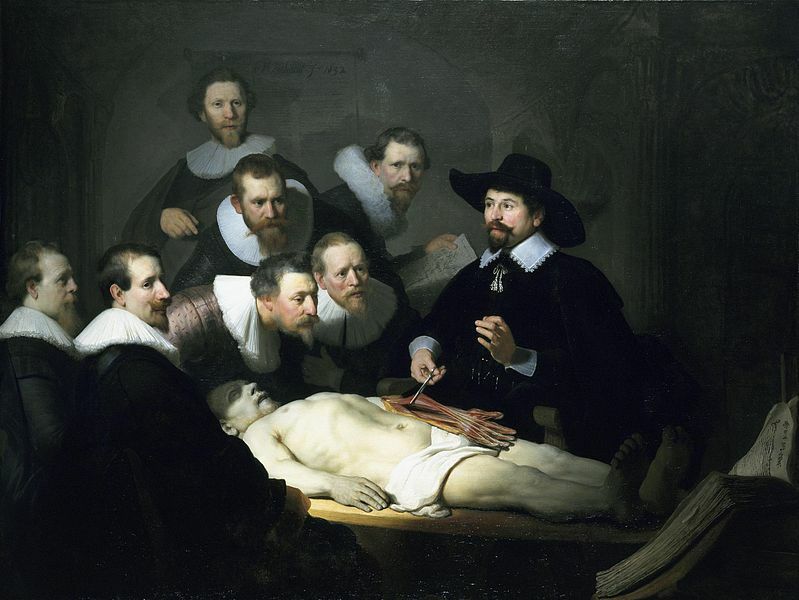 Now I immediately saw it was not a painting at all, but a digitally composed image – I actually recognized ‘Verheyen’ as one of the onlookers in Tulp’s Anatomical lesson. When I magnified the image, I noticed the bare ‘stump’ of the leg under the table, and couldn’t help laughing. Someone had put a lot of thought into this! Rembrandt, The Anatomy Lesson of Dr. Nicolaes Tulp , 1632. Oil on canvas. Mauritshuis, The Hague. I think the way Premnath has chosen to raise these questions is quite brilliant, as even people who are generally considered to be relatively smart and critical-minded (historians like myself, the author of the message Premnath is responding to – who is apparently a medical doctor) are initially willing to believe that Verheyen really dissected his own leg and wrote letters to it. This may seem silly, but on the other hand open-mindedness is also required to be a good academic. This balancing of open-mindedness and critical thinking also reminded me of another exploration of the fragility of truth and authenticity I really love: David Wilson’s Museum of Jurassic Technology in Los Angeles. This museum leaves visitors wondering which of its exhibits are real – yet they are all wonderful. I had the pleasure of visiting the museum in 2010, but if you can’t, do read Lawrence Weschler’s Mr. Wilson’s Cabinet of Wonder. Pronged Ants, Horned Humans, Mice on Toast, and Other Marvels of Jurassic Technology. Although I admit I was a little annoyed when I initially discovered I was being ‘fooled’ with the Verheyen Wiki, I think projects like Premnath’s and Wilson’s are more than necessary to keep everyone, including, or maybe especially us academics, sharp and critical about what we understand as true and authentic and factual. Contemporary art can hold up a mirror, and show us how we often construct stories unthinkingly – and that it is the task of the historian to undo these constructions and think them through and reconstruct them into histories. Only to humbly realize that those histories are also stories, of course.